The power these daggers gave to the feared SS in WW 2 is legendary. Perhaps on a level with the power, respect, and fear that a Samurai sword gave to a Samurai in 17th century Japan. 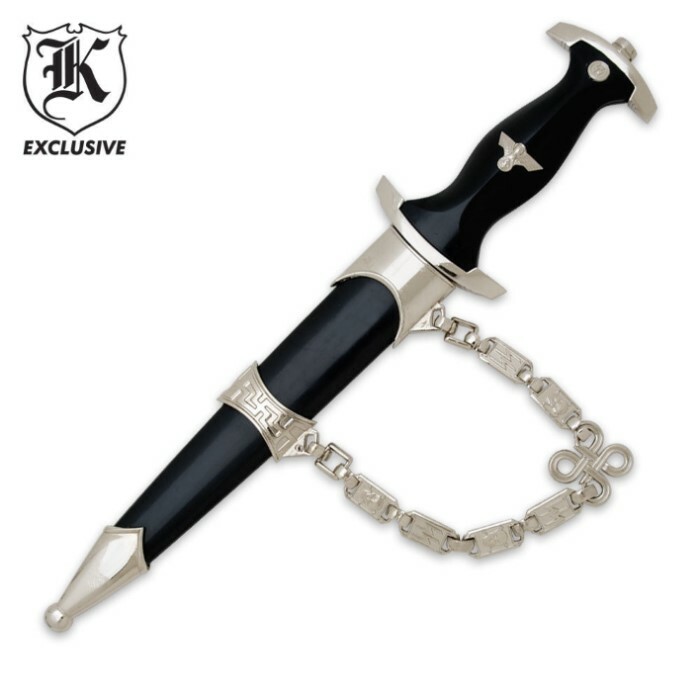 I am grateful to Bud K for saving me $5000 I would have had to pay for a real SS dagger. Actually I would never pay $5000, or even the $500 which I would have to pay for a junky cracked SS dagger with no scabbard, so basically I am grateful to have a nice looking replica to hang on my wall for less than 20 bucks. YES, it is an inch short. YES, the eagle looks like a potato with wings. YES, the SS medallion is glued on a weird angle. YES the blade is as dull as the back side of a butter knife. YES the handle and main part of the scabbard are just black plastic. YES, any expert can tell it is fake in 2 seconds. These are just details. (however, It IS a pity BudK can't have their China manufacturer do a little better.) It still looks GREAT on my wall! And in my hand, especially since I gently scraped the plastic mold marks off the handle with a sharp knife to smooth it out, and rubbed a little black into the lasered inscription to make it more visible. Also, because I was not happy that the dagger hung on my wall sideways , parallel to the floor, I gently opened and moved two short links (one is square) from the short upper chain to the longer, down side chain to make it even longer, using two needle nosed pliers. No they are not plastic, and yes, I feared they might break, so I only opened them Just barely enough to get them off, and squeezed them closed just barely enough, like they were originally. Now it hangs on my wall at a very nice 45 degree angle. and it looks GREAT! Great replica. No, it's not original, but you're not paying $8,000 either. Looks and feels good, beautiful wall hanger. Well worth the great price. 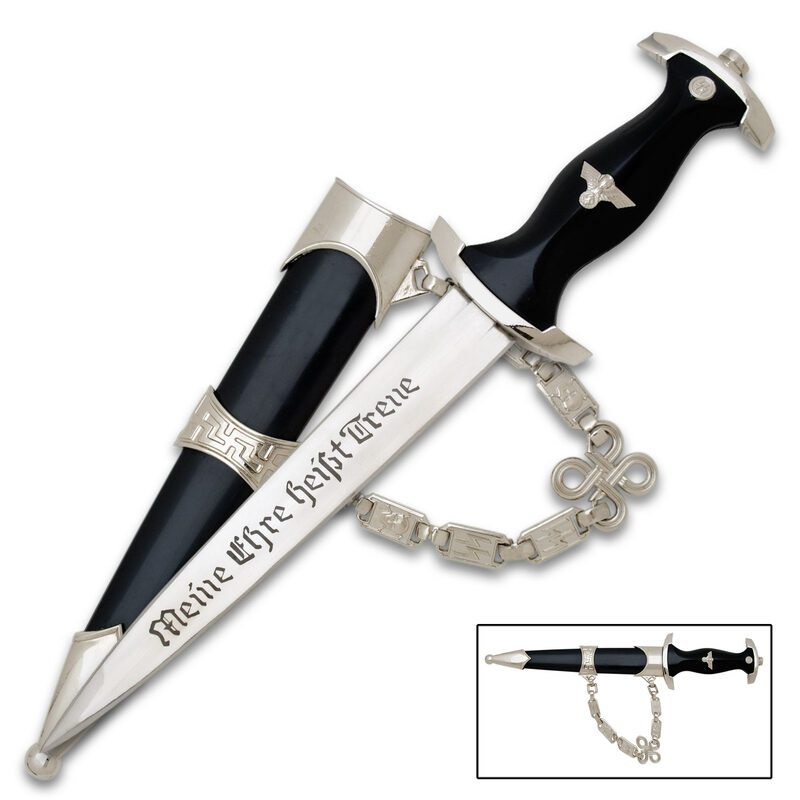 For those of you who own this dagger [ or any replica ], & don't like the China stamp or stainless steel...take it to a jeweler you know & in minutes what you don't like will be adios for about $10.00. It's fake enough as it is, but for yourself & the people you show it to, one does not need, of all countries " China " stamped on any blade. I would feel embarrassed. By the way, my jeweler is so good, you would never know anything was ever imprinted. It is a good replica. Good quality shiny blade. Two problems 1] Overall length 14" should be 15" tight on the hand with tight grip. 2] Handle a little narrower that it should be and sides of scabbard and handle have a sharp line along the sides where plastic was compressed together. This area should be smooth not sharp to the touch. I kept it because of the beautiful blade. Great piece, first off. I got this as a gift for a friend of mine and he loves it. It came sharp, well built, sturdy and very clean and in good shape. the only real problem is that it is very difficult to remove or put back into the sheath and this has resulted in the hilt assembly coming a little loose and it now rattles a bit but that's the only real issue I've seen with it. Very nice looking replica. The couple of negatives are that the "metal" brackets on the sheath appear to actually be metal coated plastic. Either that, or they are very thin metal. And the handle seems a bit light in weight. Still, it is a replica and as such it is good enough. A real one would be hundreds of dollars. This is a really nice replica. Mine came in and needed a little tightening and crimping of the links but so what! Order an ARF RC Plane and see what you have to do to it! Whats the big deal? An inexpensive WWII replica that's worthy to hang on any person or display box or war room wall. You might could take it on a hunting trip or fishing trip or show and tell around the campfire. With a nice war story it would captivate all. I am proud of mine, it's going on my wall next to my 1/16 scale Tiger 1 and Bulldog tank which is across from my P-51 and P47! What a nice addition! Thanks BudK. I bought extra's for my brothers and flying friend!